Many patients would seek treatment and replacement of missing teeth because it affects the appearance and function. When teeth are missing, the facial muscles will appear to be sunken in, giving an ageing appearance. Teeth can fall out spontaneously in the early years of life as adult teeth come through to replace the baby teeth. However, other main causes of missing teeth include decay, gum disease and trauma. What can happen if missing teeth are left as is? 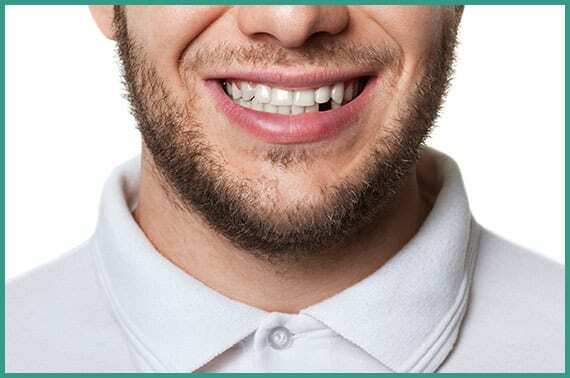 Missing teeth does not only affect a person’s appearance, self-esteem and confidence, it can also affect the function and longevity of other teeth. Self-esteem: Having visible gaps and spaces due to missing teeth can greatly affect the confidence within the individual. You may have developed a habit of avoiding to smile, or covering up your smile because of feeling embarrassed. Function: When teeth are missing, the remaining teeth will be used for chewing. As a result, these teeth will be taking on more load and forces than normally, which can potentially result in fractures. Increased chance of tooth loss: What happens when you remove a large book from a bookshelf full of books? All the books will collapse into the space! Teeth are no different. When teeth are missing, there is loss of balance and the adjacent and opposing teeth will start drifting and tilting into the space. Consequently, this can alter your bite, as well as resulting in decay and gum disease, which can potentially result in further tooth loss. Fortunately, with today’s technology, there are multiple methods to replace missing teeth, bringing back your youthful appearance. Replacement options can either be fixed (permanently in the mouth), or removable (can be inserted and removed from the mouth).